Researchers from Japan's International center for Materials Nanoarchitectonics (MANA) developed a new low-current spintronic device. The device can be used to control magnetism at a lower current compared to other spintronics devices. 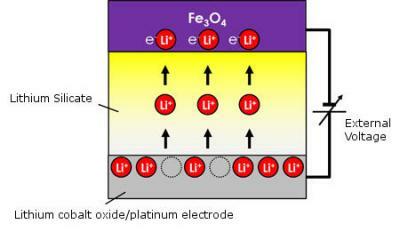 The new device is simple in structure, and it combines a solid electrolyte with a magnetic material. The researchers believe that such a device could in the future be used to make a high-density very low-power memory device. The device is based on Fe3O4 (a magnetic material). The researchers inserted/removed lithium-ions from the Fe3O4 to change the electronic carrier density and electronic structure. This, in turn, tuned the magnetic properties including magnetoresistance and magnetization. Is the Brain a Spintronic Device?